The Philips hand blender comes with additional accessories. A convenient 0.5-litre chopper with a double-action stainless steel blade cuts horizontally and vertically for smooth and efficient results. The 0.5-litre beaker with a lid can help you store the food you prepared with the blender in the fridge. No additional attachments for the blender to replace the double-action blades. You will no longer need to spend ages over the cutting board when preparing the meals for a big family dinner or gathering. With this helpful assistant, all the dull and tiresome job that keeps you busy and away from your loved ones will be done with minimum effort and in literally no time. 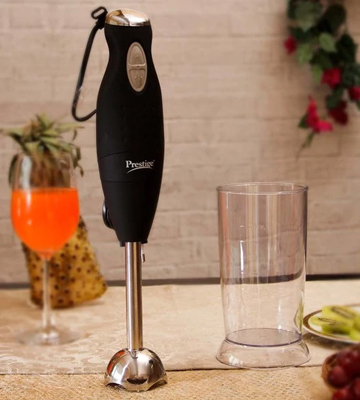 This Prestige hand blender is equipped with a chopping attachment for fast and easy cutting of vegetables for salads and a whipping attachment for beating eggs into a froth or blending delicious drinks with minimum time and effort. It is a bit noisy when used at the higher speed setting. 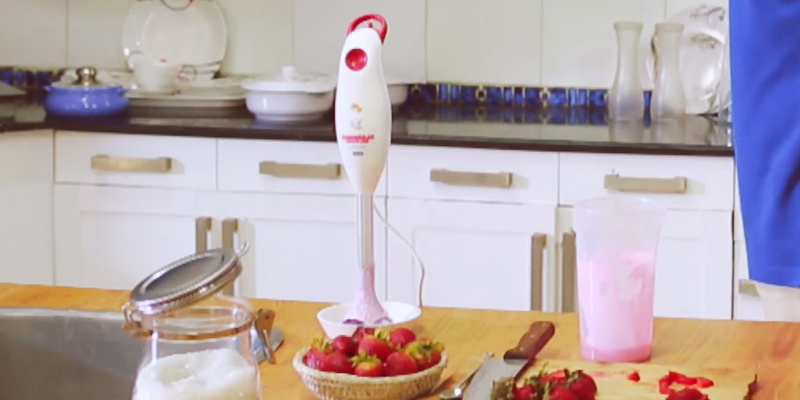 This portable hand blender with chopper will make your everyday kitchen tasks much easier. Its ergonomic grip fits perfectly in any hand size while user-friendly control buttons ensure comfortable and intuitive operation. 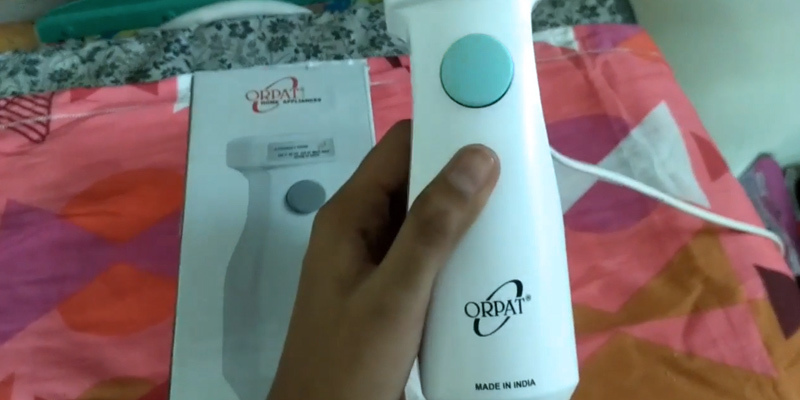 Energy-efficient and powerful, this Orpat hand blender will help to save your effort, time, and money. A 2-m long power cord makes it easy to reach an outlet if you need to use the appliance at some distance from the socket. Some users would prefer a slimmer handle. 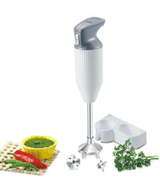 If you are looking for a heavy-duty hand blender for processing various ingredients, this model is just what you need. Allowing you to save lots of time on cooking, the unit is an excellent choice for those who live an active lifestyle. Boss manufacturer offers a handy solution for portable blender storage. Thanks to the included wall mounting stand, the B101 blender doesn't take up a lot of kitchen space and is easy to keep at hand. Its capacity is a bit low. Being a wonderful helper in any kitchen, this Boss hand blender comes with three stainless steel attachments to make blending, whisking, and chopping jobs a breeze. 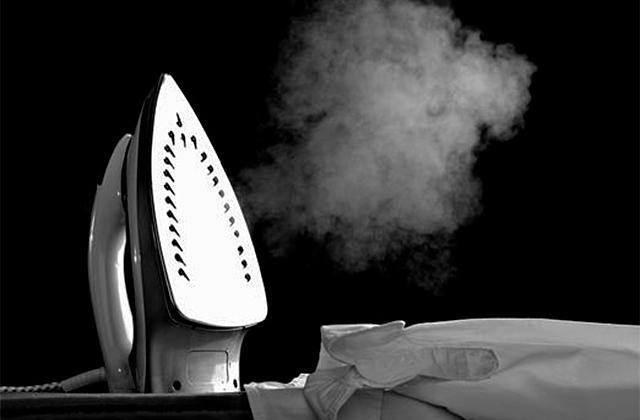 For the most convenient operation, the item has a user-friendly comfort grip. This model features an ergonomic hanging loop. When you are done with cooking and washing up, you can keep it compactly on a wall in your working area till the next usage. It might overheat after long operation. 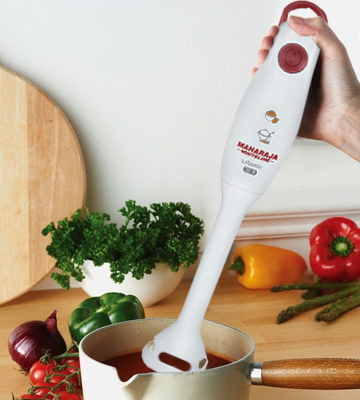 This Maharaja hand blender will help you chop and mix a variety of different ingredients saving you a lot of time on preparing your favourite dishes. 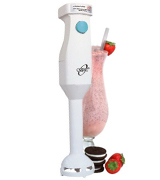 Its bell-shaped blending shaft will help you make purees, shakes, and smoothies in no time and without messy spills. 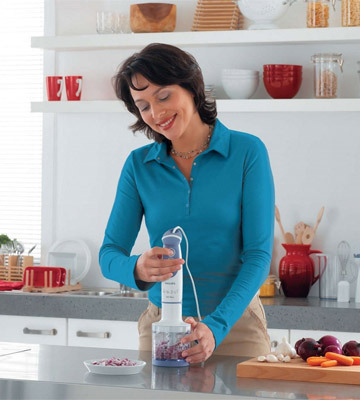 The housing of the blender is made of white polypropylene plastic with delicate lavender colour rubber inserts. Thus, this handheld blender boasts an overall aesthetically pleasing appearance and can be a nice addition to any kitchen interior. Buttons integrated into the housing can be pressed and sustained without any effort. Soft touch grip provides additional comfort and convenience in use. 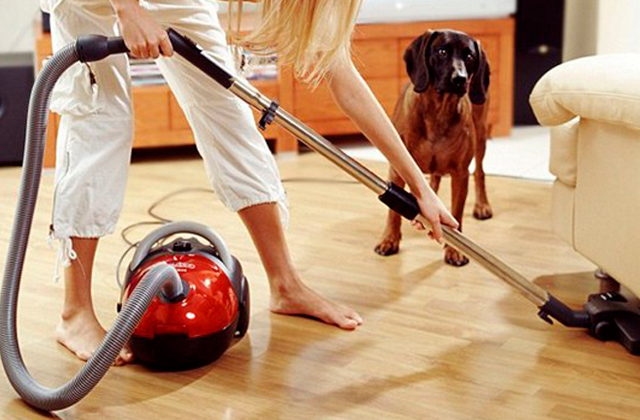 Besides, the cord with the length of 1.3 meters ensures full mobility and easy manoeuvrability of the device. Anti-splashing blade-guard will help you keep your cooking space clean and tidy, even when you are blending fluids, such as fruit juices, dairy products, or smoothies. A powerful 600-watt motor will speed up the cooking process and free up your time for your family members. 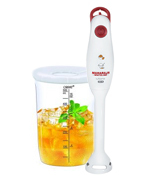 The distinguishing feature of this blending set is the availability of two handy accessories: a 0.5-litre chopper attachment and a 0.5-litre measuring beaker with a convenient lid. A chopper can do all the dull and tiresome job for you and chop a variety of ingredients. For instance, you can simply load it with herbs, eggs, onion, garlic, or any other components, and the chopper will cope with the task in mere seconds and with just a press of a button! In a word, feel free to mix, blend, and puree any soft or hard ingredients and prepare the homemade delicacies without any hassle or effort. If all those little kitchen tasks tend to take too much of your time and effort, it is time to seriously consider buying a quality hand blender like the Prestige PHB 6.0 which will allow you to churn, whisk, and blend all sorts of ingredients in the minimum time possible all while freeing you up for some other more important or interesting things for you. 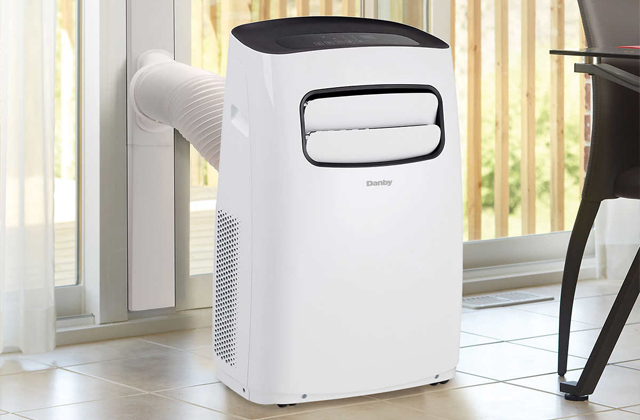 Equipped with a two-speed 200-Watt motor and an ergonomic single-touch button, the unit is both efficient and easy to operate. A measuring beaker and a blending jar, as well as chopping and whisking attachments, are included in the box. Whether you need to whisk eggs or whip some cream for making pastry, or you just want to make a glass of cold coffee or another refreshing beverage, the Prestige PHB 6.0 hand blender will come in handy. With this blender, food preparation will not pose any difficulty or challenge to you anymore. However, the most peculiar feature of this blender is that it comes with a wall mount allowing you to hang it on a wall so that you can have more space for other appliances. Powerful and so convenient in use, it will be your best helper in the kitchen. If you are looking to buy multifunctional kitchen appliances that would facilitate your kitchen tasks, this selection of food processors should definitely pique your interest. With one of them, you'll be able to slice, dice, cut and shred food in virtually no time, making exquisite family meals and treating your loved ones. While choosing kitchen appliances people usually consider how efficient the product is in terms of energy consumption and overall performance. With regards to the Orpat HHB-100E hand blender though, it's difficult to go wrong. 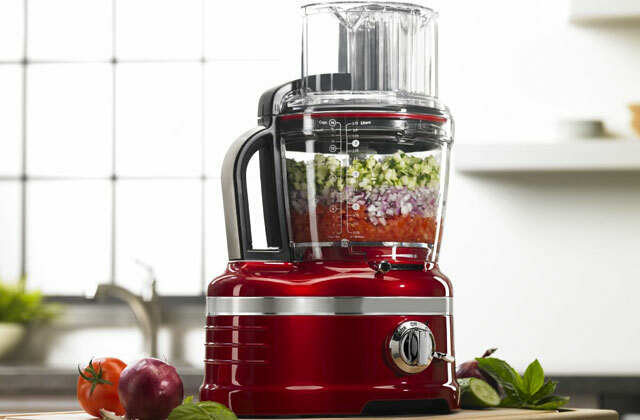 Boasting a competitive capacity of 250 Watts, this blender will allow you to make a great variety of exquisite meals using all sorts of mixed ingredients. With that, it won't be heavy on your electricity bills, since the amount of power it consumes is very little which makes it an alluring choice for consumers who plan to use the blender every day. The Orpat HHB-100E can help you handle a wide range of tasks, thanks to the fact it has a powerful and durable motor and the blades on it are very sharp. For users' additional comfort, the manufacturer fitted this blender with a long 2-m cord which gives mobility and freedom of movement. After the use, it's very easy to clean. All you need to do is wash the blades under running water. 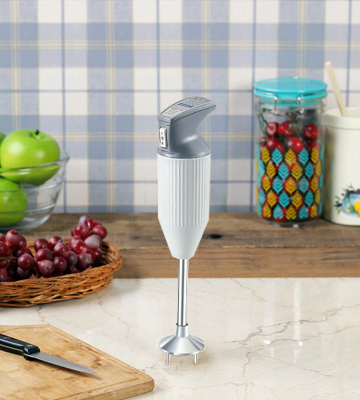 Besides, this compact hand blender can be mounted on a wall for convenient storage. Finally, it has a handy switch control and ergonomic grip to make your daily food preparation as easy as possible. If you adore crispy delicacies like French fries or roasted chicken wings but want to cut down on greasy and oily food, your only right solution is to get an air fryer with the help of which you'll be able to cook all those meals using only a few tiny drops of oil. 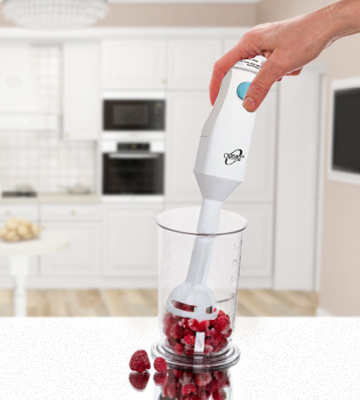 Designed to make your everyday chores easier and help you save loads of time cooking, this Boss hand blender boasts a powerful 12 000 RPM motor with two speed settings. 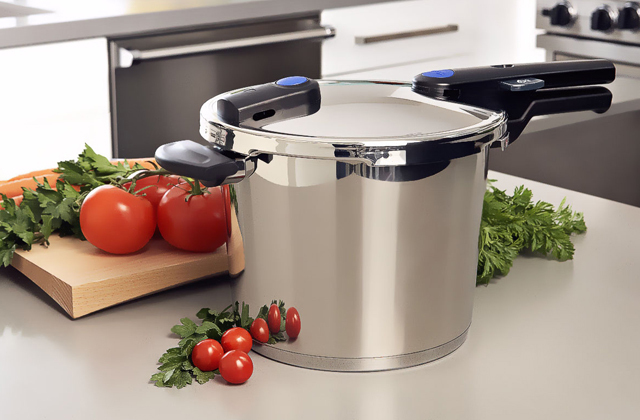 To help you deal with a variety of chopping, dicing, and slicing tasks, the unit comes with three interchangeable stainless steel blades. 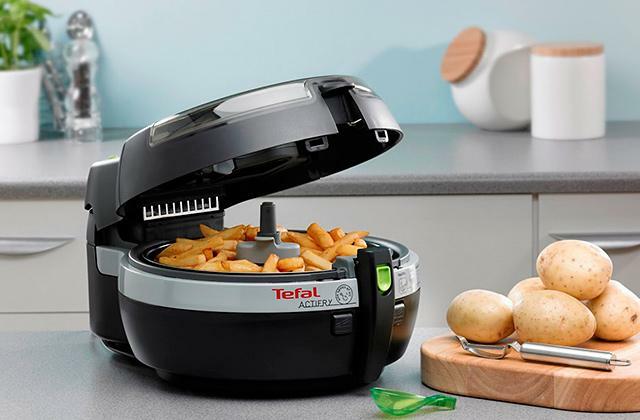 Thanks to these attachments and the power of motor, almost any cooking task can be accomplished in no time and with minimum effort. Moreover, you can use this blender with any container and it will work perfectly due to its compact dimensions and lightweight ergonomic design. It is also very simple to maintain and clean under water. For enjoyable and time-efficient cooking, it is important to keep your kitchen gear well organized. With this in mind, the manufacturer has included a wall mount allowing you to store the blender over your countertop so that you could have it within easy reach anytime. 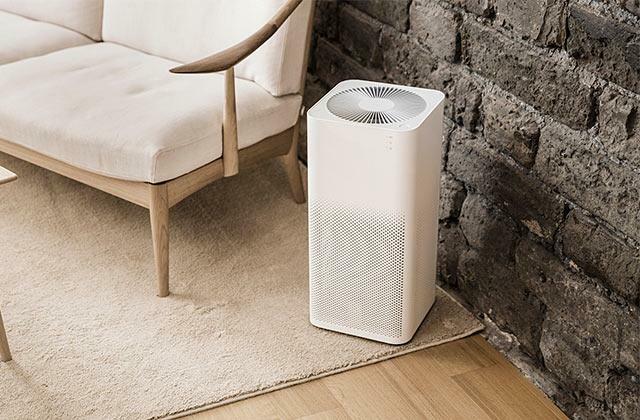 The blender looks very nice and stylish owing to its elegant grey and white housing and overall sleek design which allows it to blend with any interior perfectly. A great product if you look for something functional, affordable, efficient and, well, pretty. 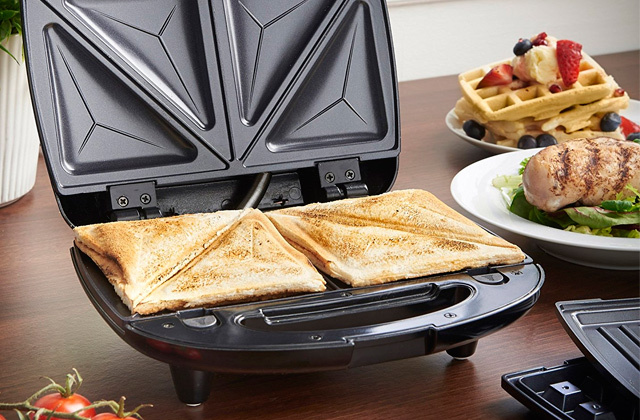 Get one of these wonderful sandwich makers to cook nutritious healthy breakfast in a breeze. One of the largest brands in the industry, Maharaja is known and loved all over the country. If you are looking for a quality appliance for fast and easy preparing of baby food or for making healthy and delicious purees and smoothies, this Maharaja hand blender can be a wonderful choice. First of all, its 350 Watts capacity and super sharp blades will help to process fruit and vegetables into wholesome dishes and beverages in a wink. Next, the unit is equipped with everything to make your kitchen chores as easy as possible. 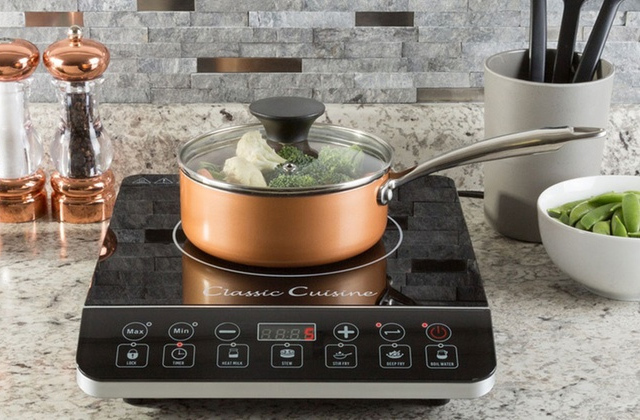 It has a plastic detachable foot for easy cleaning and a bell-shaped blending shaft that prevents liquids and soft food from splashing and spilling all over your countertop. 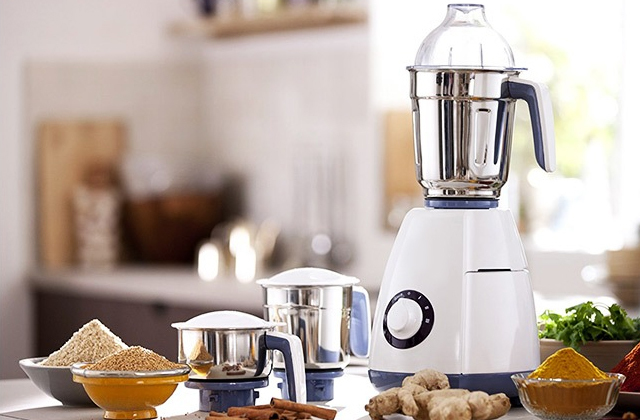 Lightweight and compact, the blender is also very convenient to use featuring a comfortable-to-grip handle, a user-friendly switch button, and a hanging loop. You can put the blender in a kitchen drawer, keep it on your countertop, or hang it on a wall; whatever place you choose, it won’t take up a lot of space. Of course, we would be remiss to end up this review without mentioning how beautiful the design of this blender is. With such a modern red and white housing, the Maharaja hand blender, without a doubt, will add a cheerful mood to any kitchen. 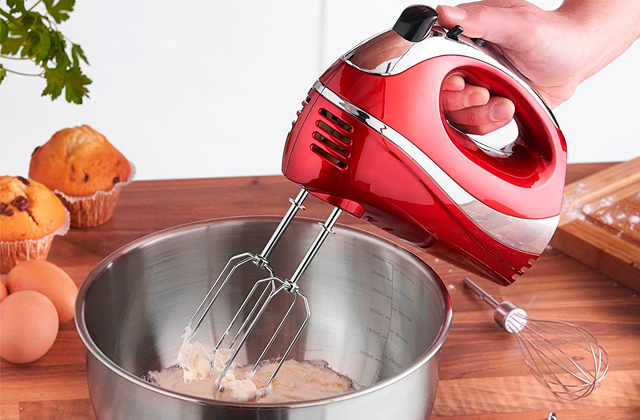 A hand mixer is one more handy appliance that can help you prepare delectable pastries and stunning homemade desserts requiring very little of your time. The hand blender is a convenient kitchen appliance used for a variety of tasks, such as grinding, mixing, blending, or even pureeing food in the same container, that it is being cooked. Note, that a handheld blender’s main advantage over other food processors is that it doesn’t require the food to be loaded into a different vessel for mixing. You can even use it when the food is still in the pan on the stove. Immersion blender, as it is also known, is a compact and lightweight tool which can be stored in any cupboard, hanged on the wall, or placed in a designated storage stand right on the kitchen countertop. What is more, this useful device may come with different attachments, extra blades, and additional accessories to empower you to simplify even a bigger range of cooking chores. Experimenting with cooking and trying out new recipes will no longer be a problem with such a mighty kitchen assistant. You can easily diversify your daily menu with the help of a great blending set. Feel free to cook whatever your heart desires, the hand blender will help you cope with any daunting task in a breeze with just a gentle press of a button! You can grind vegetables or nuts, whip cream, mix the ingredients for cocktails, prepare nutritious smoothies, mince the meat, prepare chutneys, sauces, and a lot more! 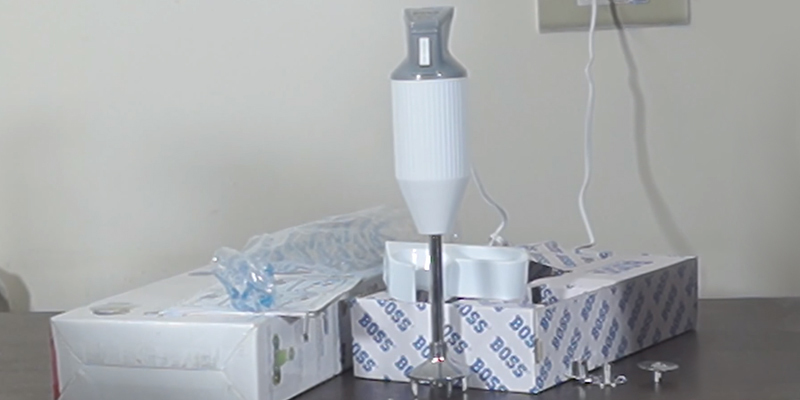 We believe our review will help you choose a suitable handheld blender in accordance with your preferences and needs. However, if you need to shred more solid ingredients, we advise you to consider purchasing a countertop blender in addition to a handheld one. 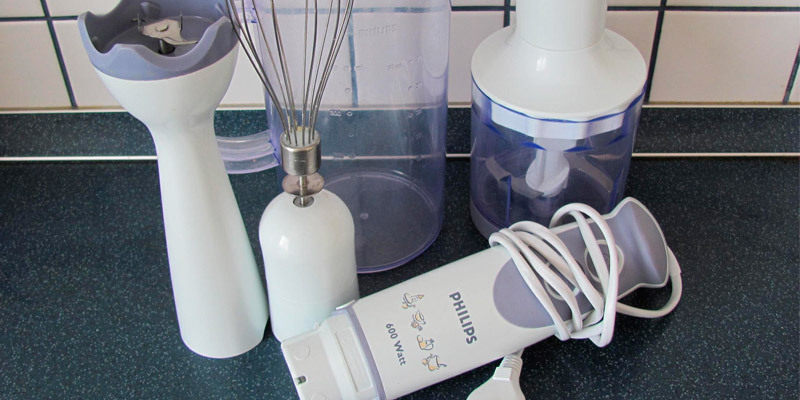 The most important feature to consider when choosing a hand blender is Equipment and Functionality. These two concepts are linked very closely. The equipment of electric hand blender will influence directly its operations, which you can perform with the help of this device. If you think that a handheld blender has only one standard attachment, you are mistaken. So, what kind of attachments does a blender have? The additional accessories may include, for instance, an accompanying whisker for making dough, preparing fluffy batter, or beating eggs (and can replace a mixer). 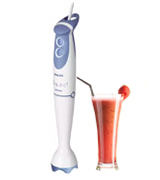 The hand blender can also have the attachment which can slice or cut the products into cubes. Such possibilities facilitate the preparation of salads, soups, and many other meals. In addition, a convenient chopping bowl helps you save the time and chop the food directly in the bowl. The set may also come with different stainless-steel attachments for grinding and shredding. The Number of Speeds is a vital feature. Hand immersion blenders can have from 1 to 24 different speeds. Switching between speeds is performed continuously or stepwise. A wide selection of speeds allows you to choose the most appropriate one for different products. For example, you can start mincing the meat at a low speed and then gradually increase it to the higher. Take note, if you want to whisk eggs in a small container, it is better to start with a low speed, because you can splatter all the contents around. Thanks to a smooth switching of speeds, you can accurately select the appropriate mode. 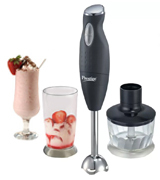 Power is also one of the main features when choosing the best hand blender. The more power a device has, the faster you will cope with food processing. You can hardly notice the difference between hand blenders when beating the eggs. Essentially any blender will be good enough for a task like that. But when you are cutting vegetables (onions, carrots etc.) or cooking cream soup, you can notice that a powerful hand blender can cope with the task much quicker. 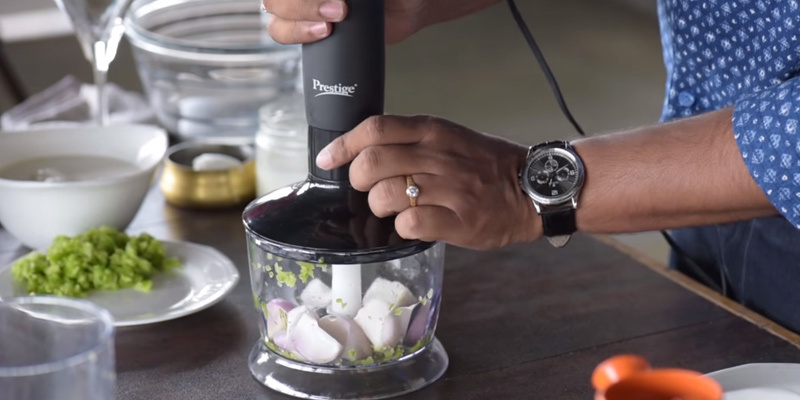 Moreover, the immersion blender with little power is unlikely to grind frozen vegetables or mince meat. But there might be some exceptions since the technology advances as time moves forward. 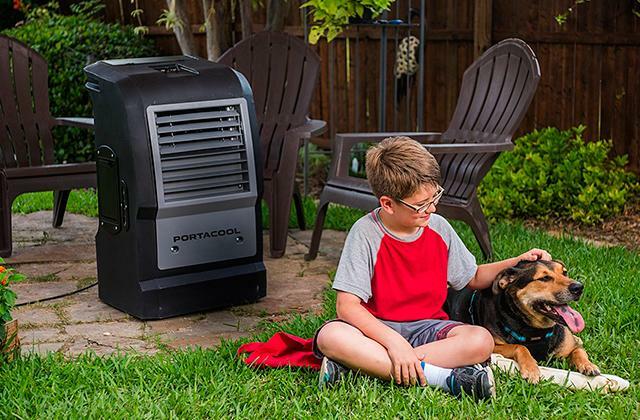 For example, the new cutting-edge lithium-ion technology allows users to crush ice with the power of 7 Watts only. The last but not the least, pay attention to the Design and Construction of a handheld blender. The body of the blender can be made of plastic or metal (stainless steel or aluminum). Models with a metallic housing are usually more expensive. Yet, we can point out that popular stainless steel units are usually stronger and more durable. However, on the downside, they often have a heavier weight. For many customers, it may be not a very good feature because it is rather tiring to hold a heavy tool in a hand for a long time. You should know, that the plastic housing is not that bad when handled carefully. In addition, the presence of anti-slip inserts on the body can make a great addition! They can be made of rubber, elastic or, so-called, soft-touch plastic. 2. Mariette Mifflin Before You Buy a Kitchen Blender, The Spruce. February 02, 2017. 3. Jane Darling How to buy the best hand blender, Which? 4. Hand Blender Buying Guide, Wayfair.